Soon to be 85, Joe Temperley has numerous memories of his long career in jazz. 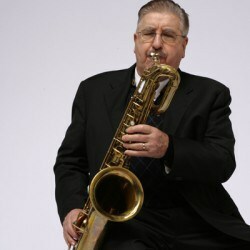 The big-toned baritone saxophonist (who is also proficient on bass clarinet and tenor, alto and soprano saxophones) has lived in New York City since 1965 and still speaks with a Scottish accent after all these years. Born in Lochgelly, Scotland on Sep. 20th, 1929, Temperley was 19 when he moved to London in the late ‘40s—and it was there that he enjoyed an eight-year association with British trumpeter/bandleader Humphrey Lyttelton. Temperley visited New York City for the first time when he was touring the US with Lyttelton in 1959 and went on to play with a long list of American jazz heavyweights, which included Woody Herman, Clark Terry and the Thad Jones/Mel Lewis Orchestra. Since 1988, he has been working closely with trumpeter Wynton Marsalis as a member of the Jazz at Lincoln Center Orchestra. During a recent interview, the veteran recalled some of the highlights of his long career. Joe Temperley: The right thing for me to do was to leave London and come to New York. When I first came here, New York scared me to death. But after a while, I got used to it. I started working here and I’ve been working here ever since. I worked with the Ellington band, I worked with Thad Jones and Mel Lewis for three and a half years and I worked with Benny Carter, Clark Terry, Duke Pearson, Joe Henderson and all kinds of people. TNYCJR: When you visited for the first time in 1959, did you feel intimidated by the wealth of jazz talent? JT: I felt, “What the hell am I doing here?” Everybody sounded so good. New York was a completely different place then. It wasn’t like it is now. I mean, there is still a lot of good playing going on here, don’t get me wrong. But then, there was much more. You could go and see Hank Jones, Zoot Sims and Al Cohn, Milt Jackson and Roland Hanna all in one night. They were all working in different places in New York. TNYCJR: You’ve lived here for almost half a century. JT: Since the end of 1965. And by May of 1966, I was onthe road with Woody’s band. TNYCJR: What are some of your fondest memories of playing with Woody Herman? JT: My fondest memory is playing with Sal Nistico. I thought that Sal was the most magnificent saxophone player. Woody’s band was tough. The bus rides were long and I wasn’t used to that because when you travel with a band in the UK, the longest bus ride is probably 150, 200 miles—and that’s really extreme. But 200 miles is nothing here in the States. One journey we had was from Pensacola to Cincinnati. TNYCJR: You’re been doing a lot of teaching. In what ways do the young jazz musicians you encounter in New York now differ from the young jazz musicians you encountered during the ‘60s? JT: There was very little educational stuff for jazz going on then. People mostly learned from doing it. TNYCJR: These days, so many young jazz musicians are classically trained. Studying jazz and studying European classical music often go hand in hand. JT: I try to make my students listen to opera, to singers—especially tenors that sing arias and things. The voice production is very akin to playing an instrument. TNYCJR: Some jazz instrumentalists have a prejudice against singers and don’t care to work with them, but you obviously don’t feel that way. JT: I’ve played with a lot of singers. I played with Billie Holiday in London. And I’ve played with all kinds of people here: Sarah Vaughan, Ella Fitzgerald. Aretha Franklin I’ve worked with several times. I have a greataffinity with singers. I love to listen to singers. People who can sing. I’m not talking about pop singersnowadays—I’m talking about people that can sing. TNYCJR: You also worked with Peggy Lee. JT: Peggy Lee I loved. I did a Broadway show with Peggy. She said it was going to run for two years, but it ran for two days. She said she consulted her astrologer and her astrologer came up with the figure two. So she assumed it was going to run for two years and it ran for two nights and was closed. But Peggy was great. TNYCJR: You no doubt have some fond memories of playing in the Thad Jones/Mel Lewis Orchestra. JT: Oh, boy. All my heroes were playing in that band: Snooky Young, Jimmy Nottingham, Bob Brookmeyer, Garnett Brown, Richard Davis, Jerome Richardson. I love Jerome Richardson. The saxophone section was fantastic: Jerome and Jerry Dodgion, Eddie Daniels, Joe Farrell and myself. It was just phenomenal. TNYCJR: What a learning experience. JT: Oh, God yeah. It was wonderful. What a great band that was. Monday night used to be a real, absolute celebration. All kinds of people used to come in. André Previn and people like that used to come down and the Ellington guys used to come in a lot. Ray Nance and Paul Gonsalves used to sit in. It was just a fantastic experience. TNYCJR: You knew a lot of the Ellington guys before you actually played with the Ellington band in 1974. JT: Oh, yeah. When I played with Humphrey Lyttelton’s band, the Ellington band came to London. The Ellington band went to the UK, the Basie band went to the UK—and Ronnie Scott’s Club used to get people like Coleman Hawkins and Ben Webster. All kinds of people. I saw Coleman Hawkins there with Milt Buckner and Papa Jo Jones. What a treat. And I was sitting with Ben Webster. TNYCJR: When you were still living in London, you saw a high caliber of visiting American jazz musicians. JT: Stan Getz came, Sonny Stitt came, Miles Davis came, Dizzy came. I got very friendly with Eric Dolphy. TNYCJR: How did you end up replacing Harry Carney in the Ellington band in 1974? JT: When Harry died, John Gensel, who was the pastor at the Lutheran church at 54th Street and Lexington Avenue, asked me to play at Harry’s funeral. Duke Ellington used to call John the shepherd of the night flock and I played “Sophisticated Lady” at Harry’s funeral because that was Harry’s solo. Mercer Ellington offered me the job and the next thing I knew, I was on the bus going through the Lincoln Tunnel with the Ellington band for six weeks of one-nighters. TNYCJR: You also played with Buddy Rich’s band. JT: I called him Bloody Rich. We had a pick-up band out of New York and we had a saxophone section of Sal Nistico, Joe Romano, Lew Tabackin and Eddie Daniels. We went to Canada for five nights. I wasn’t a regular member of the band, though. I was just subbing. TNYCJR: How often did you hear Buddy Rich berating and screaming at the permanent members of the band? JT: After every set. He used to get the band in the band room and curse them out: oh, you all are just a bunch of no-playing motherfuckers. Things like that. He would say terrible things to them like, “I’ve got a band coming in from L.A. tomorrow that will cut you to ribbons.” Buddy wanted me to go in the band, but I wouldn’t go in the band. I didn’t want to live like that. Touring is hard enough without getting a lecture after every set. But Buddy sure could play the drums. TNYCJR: Do you have plans to record in the near future? JT: I would like to do a ballad album. I’ll probably get around to it. I’d like to do an album of Ellington and Strayhorn. I went out with Billy Strayhorn one night in London—Billy and Harry Carney and me. We were in the Dorchester Hotel. Billy was drinking gin and tonic in a pint glass. Half a pint of gin and half a pint of tonic—and he had about three of them. Billy liked to drink. TNYCJR: You’ve been with the Jazz at Lincoln Center Orchestra for 26 years now. For more information, visit jalc.org/meet-the-orchestra/joe-temperley. Temperley is at Dizzy’s Club Sep. 5th-7th and Rose Theater Sep. 18th-20th with Jazz at Lincoln Center Orchestra. See Calendar.